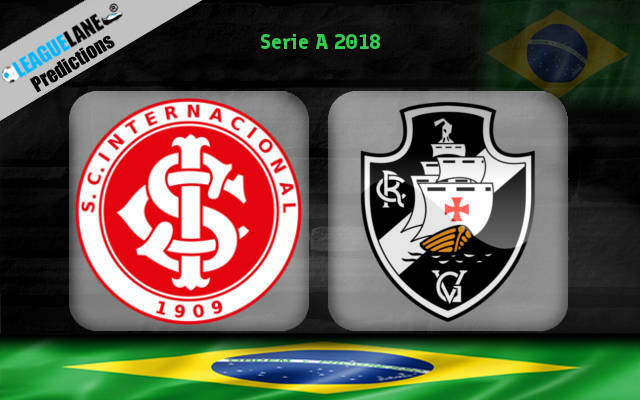 One of the most interesting matches in the 12th round of Brazilian Serie A is going to be contested between Internacional and Vasco da Gama. Home side is enjoying a very good start of the season after being promoted from the Serie B. They are sitting on the 5th place being just one point behind Atletico Mineiro on the position number two. Leandro Damiao and the lads have been very good on the back while their attack is producing more than enough. Internacional haven’t lost a single game when playing in front of their fans and have allowed just one goal to their visitors. Vasco da Gama improved a bit after not so great start of the campaign and they are placed in the middle of the table. Jorginho’s side started scoring more goals however they need to tighten up their defence a bit. Although the visitors suffered just one defeat when playing away from home, they missed the chance to win as they were involved in many draw matches. Since 2001, the hosts have suffered only one defeat to their opponents and during that period they booked four victories. Their matches are usually a joy to watch in terms of goals scored and in the last five occasions the crowd wasn’t able to see more than two goals just once. Home side is performing very confidently at their pitch and they are favourites for snatching a win in this one. Internacional are more than capable of booking another win which can keep them among the top teams in the competition. Both teams have been involved in pretty efficient clashes lately and according to their tradition it wouldn’t be surprising if we see at least three goals once again. Over 2.5 FT @ 2.20.